I spent the 4th of July week in Aspen, Colorado with family and friends. We had the best time! The weather was glorious-sunshine, blue skies, mountain air-who could ask for more? There were holiday festivities, scenic hikes, and mountain chamber music, but the highlight of the week for me was an incredible performance by violinist Joshua Bell and the Aspen Symphony. What a talent he has! Weeks later, I find myself still thinking about the concert and wondering if it's it too late for me to take up the violin??? There were many delicious meals that we shared during our vacation. But more about that later. First, a few photos from our trip. 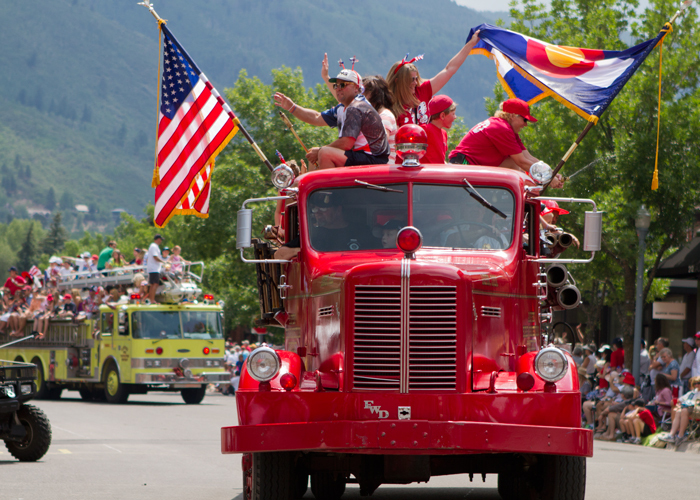 On the 4th of July, there was on an old fashioned parade through the center of town. And fireworks in the evening over Aspen Mountain. About those meals... Aspen has many fine restaurants. Some of my favorites are Justice Snow, Element 47, Matsuhisa, and Aquolina. But when our group of 6 had lunch at the Hotel Jerome, we absolutely flipped over their bacon marmalade served with warm cornbread. It disappeared as quickly as it was served! I couldn't resist asking for the recipe, and much to my surprise, the very gracious assistant manager Elisa Curry, sent it to me! As the saying goes, be careful what you wish for. This stuff is incredibly decadent, addictive, and we can't stop eating it. Thanks again to Elisa and the Hotel Jerome for sharing! Cook the bacon in a saucepan over medium heat until the fat has rendered and the bacon begins to get crispy. Add the onions and saute until soft, 8-10 minutes. Add the garlic and cook for 2 minutes. Add the vinegar, coffee, brown sugar, maple syrup, bourbon, chipotles, cumin, salt and pepper. Turn the heat down to a simmer and cook until thick and syrupy, about 1 hour. Keep a watchful eye at the end to prevent burning. While still hot, pulse lightly in a food processor to get it to the consistency of marmalade while still maintaining the texture of the bacon. Store in the refrigerator but serve slightly warmed or at room temperature. Preheat the oven to 350F. Butter or spray a 12 cup muffin tin. In a large bowl, stir together the flour, cornmeal, baking powder, baking soda, and salt. In a small bowl, whisk together the butter and sugar. In another large bowl, whisk the eggs until well blended. Whisk in the buttermilk, then the oil, and finally the sour cream. Then whisk in the butter-sugar mixture. Pour the wet ingredients into the dry mixture and fold carefully until well combined. Divide the batter among the 12 muffin cups. Bake for about 25 minutes, or until the edges of the muffins are golden brown and the center springs back when pressed. Cool in the pan on a wire rack for 20 minutes, then remove from the pan.